← NACCHO Aboriginal Health debate #changethedate #australiaday : #InvasionDay, #SurvivalDay, or Day of Mourning? The awards were established in 2014, and will held annually. The inaugural awards were held at NSW Parliament House, and were welcomed by the Hon Linda Burney, MP and included key note speakers Dr Yalmay Yunupingu, Ms Gail Mabo, and Mr Anthony Mundine. A number of other distinguished guests such as political representatives, indigenous leaders and others in the fields of human rights and social justice also attended. The Awards were presented by leading Aboriginal and Torres Strait Islander elders, and leading Indigenous figures in Indigenous Social Justice and Human Rights. 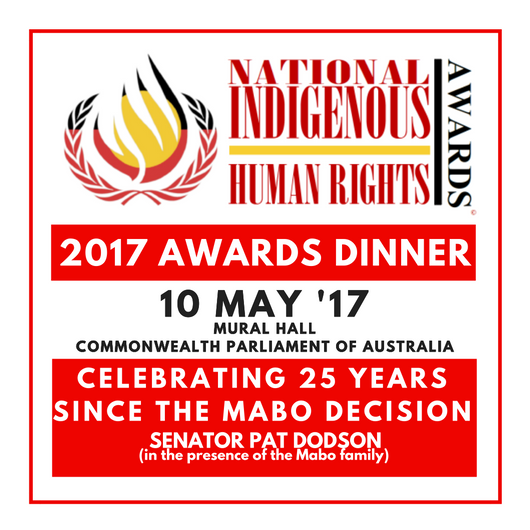 All recipients of the National Human Rights Award will be persons of Aboriginal or Torres Strait Islander heritage. To an Aboriginal and/or Torres Strait Islander person who has made a significant contribution to the advancement of Human Rights for Aboriginal and/or Torres Strait Islander peoples. Dr Yunupingu is the first Aboriginal from Arnhem Land to achieve a university degree. In 1986 Dr Yunupingu formed Yothu Yindi in 1986, combining Aboriginal (Yolngu) and non-Aboriginal (balanda) musicians and instrumentation. In 1990 was appointed as Principal of Yirrkala Community School, Australia’s first Aboriginal Principal. Also in that year he established the Yothu Yindi Foundation to promote Yolngu cultural development, including Garma Festival of Traditional Cultures Dr Yumupingu was named 1992 Australian of the Year for his work in building bridges between Indigenous and non-Indigenous communities across Australia. In memory of Eddie Koiki Mabo (1936-1992), this award recognises an Aboriginal and/or Torres Strait Islander person who has made a significant contribution to the advancement of Social Justice for Aboriginal and/or Torres Strait Islander peoples. Eddie Koiki Mabo was a Torres Straits Islander, most notable in Australian history for his role in campaigning for indigenous land rights. From 1982 to 1991 Eddie campaigned for the rights of the Aboriginal and Torres Strait Islanders to have their land rights recognised. Sadly, he died of cancer at the age of 56, five months before the High Court handed down its landmark land rights decision overturning Terra Nullius. He was 56 when he passed away. To an Aboriginal and/or Torres Strait Islander person who has made a significant contribution to the advancement of sports among Aboriginal and/or Torres Strait Islander peoples. Anthony Mundine is an Australian professional boxer and former rugby league player. He is a former, two-time WBA Super Middleweight Champion, a IBO Middleweight Champion, and an interim WBA Light Middleweight Champion boxer and a New South Wales State of Origin representative footballer. Before his move to boxing he was the highest paid player in the NRL. In 2000 Anthony was named the Aboriginal and Torres Strait Islander Person of the Year in 2000. He has also won the Deadly Award as Male Sportsperson of the Year in 2003, 2006 and 2007 amongst others.